RealElvish.net > Blog > Realelvish Academy News > New Name Chosen and Book News! New Name Chosen and Book News! April 5, 2017 Fiona J. The new name for the Sindarin class website has been chosen: Realelvish Academy! I’m in the process of reorganizing the website to match the new textbook. The way I’m organizing it, I could add more classes to it. Things like, a Quenya course, or maybe a Thalas’sian course if I feel like it. Maybe some more elvish writing courses. Anyways, currently there are 3 courses, all for Sindarin. They are, Carpho Edhellen! (Speak Sindarin!) Teitho Edhellen! (Write Sindarin!) and Gelio Edhellen! (Study Sindarin!). 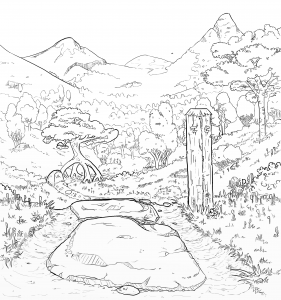 And, the line art for the cover of the textbook is completed! The cover itself will be done up in color, but this is the line art for it, to give you a sample of what it’ll look like.